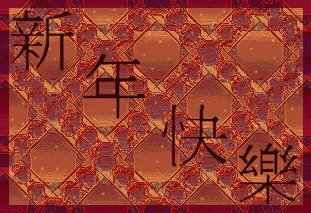 Happy Chinese New Year to all of you especially to my Chinese friends. May the Year of the Dog be a prosperous one for all of us! Last year I was in Miri during the Chinese New Year, and so was able to visit a few friends. I am going to miss all the sweet barbecued pork meat. :-( I don't think I have seen any of those at the Asian supermarket here in Sacramento. I love all our Malaysian cookies and also love to try the different cakes that are usually staple during such festive seasons in Malaysia. I was pleasantly surprised to receive a phone call from a friend in KL yesterday wishing me Happy Chinese New Year. I don't know if she thinks I am Chinese? Heheh, it was very thoughtful of her though. I would love to be in San Francisco during the Chinese New Year. I hear that in Chinatown, there is always a big celebration going on .. lion dance, fire-crackers .. all the cultural stuff. Yeah, maybe another time. Otherwise for the rest of us here, the new year will be just another day. Cong Xi Fa Cai! You mean the Chinese Community in the States don't have the open house culture that we do in Malaysia? What mostly happens during Chinese New Year there - it would be interesting to note. I don't think there is an open house culture like we have in Malaysia here. You don't simply drop in at a person's house without asking if you can come first! Maybe the chinese have the family get together thing on CNY eve. I don't really know. Pity you didn't get to san francisco. I would love to see some pics of the celebration there.